The Ahwazi Arab community is witnessing a fresh wave of arrests, detentions and killings at the hands of the Iranian regime, which has instituted martial law and imposed an information blackout over the region. Detainees are being held in solitary confinement in secret detention centres run by the Ministry of Intelligence. Two young Arabs have died while being held in the custody. Nasser Alboshokeh-Darafshan (20), pictured right, was arrested on 26 January and was killed under torture on 30 January. Mohammad Kaabi (21) was arrested on 21 January and killed under torture on 2 February. Nasser was taken to a hospital in Ahwaz when he was close to death, but doctors claimed the extent of his injuries – broken neck and ribs, bleeding from the nose and ears and deep wounds all over his body – meant his life could not be saved. However, the authorities claimed his death was of ‘natural causes’. Mohammed was arrested along with his father Jasim and sister Khadijeh in Shush on 21 January. The security forces prevented the family from seeing Mohammed’s body and burying him and forbid them from holding any public mourning. The arrests of the three had sparked protests in Shush led to protests and the subsequent imposition of martial law on 25 January. At least 27 arrests were carried out in the city’s Ahmadabad, Khazireh and Davar districts in response to the unrest. The arrests began in November with at least 65 cultural activists, students, musicians and poets being rounded up ahead of the annual protests commemorating the April 2005 Ahwazi uprising which was provoked by long-standing discrimination and ethnic cleansing policies. The arrested also include 35 year old Majid Bawi, who is disabled and paraplegic. 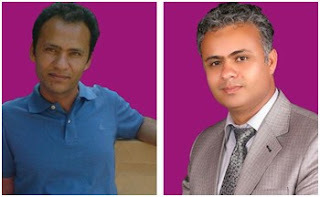 The arrests began with the detention of history teacher Hassan Manabi (left) and his brother Ghalib (right), a prominent singer. Both have criticised government policies towards the Ahwazi Arab ethnic group. Members of the family were previously arrested during the 2005 uprising, during and after which scores of Arabs were killed and thousands detained. Their experience of torture during previous arrests prompted them to flee to Turkey and seek asylum in late 2010. However, they were penniless and without protection from the UNHCR, which was slow to process their applications and resettlement. The detention of Hassan’s wife and other members of the family prompted them to return in September 2011. On their arrival, they were briefly detained but then re-arrested in November on charges of espionage for the US and the UK and accusations of links to Ahwazi opposition groups. Their detention and ill-treatment was shortly followed by arrests of anyone connected to the men and others seen as representing a threat to the regime. A previous wave of arrests, targeting Arabs involved in cultural activities, occurred in early 2011 when the Arab Spring revolts emboldened many Ahwazi Arabs. The regime sees any overt display of indigenous Arabic culture and criticism of ethnic discrimination as secessionist and hostile, claiming involvement of foreign security services. The current government campaign appears to be focused on allegations of religious conversion from Shi’ism to Sunnism and graffiti calling for boycotts of the forthcoming election and expressing sympathy for the Arab Spring revolts. Those arrested come from the towns of Ahwaz, Hamidiyeh and Shush. While most Ahwazi Arabs are traditionally Shia, they overwhelmingly reject the religious dogma of the Iranian regime and have a tolerant attitude towards religious difference, their homeland being a place of pilgrimage for Jews and Mandeans. Some Ahwazis are, however, converting to Sunnism as a political act of rejection of the official dogma, which could attract religious charges of moharebeh (enmity with God); Sunni mosques are banned in the region. Elections are subject to fraud and a high level of manipulation, but the regime still fears low turnout as a threat to its legitimacy and as such calling for a boycott is regarded as a seditious act. Following the wave of arrests in early 2011, many Ahwazi Arab cultural activists and teachers were held in political prisons and secret detention facilities, often in solitary confinement where they have been tortured. Three men – Hadi Rashedi, Hashem Shabani and Taha Heidarian – were forced to confess on Iran’s English language Press TV to trumped up charges of participating in a non-existent group called Khalq-e Arab, portrayed by the regime as a terrorist organisation supported by the US, UK and foreign-based human rights activists.